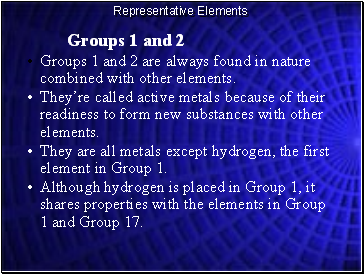 Groups 1 and 2 are always found in nature combined with other elements. 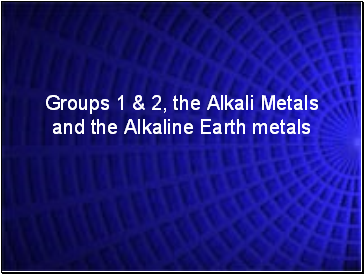 They’re called active metals because of their readiness to form new substances with other elements. 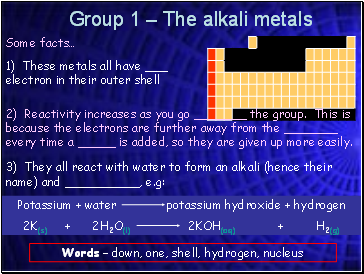 They are all metals except hydrogen, the first element in Group 1. Although hydrogen is placed in Group 1, it shares properties with the elements in Group 1 and Group 17. 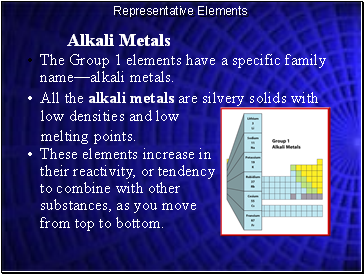 The Group 1 elements have a specific family name—alkali metals. These elements increase in their reactivity, or tendency to combine with other substances, as you move from top to bottom. 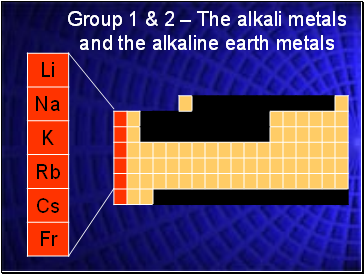 Next to the alkali metals are the alkaline earth metals. 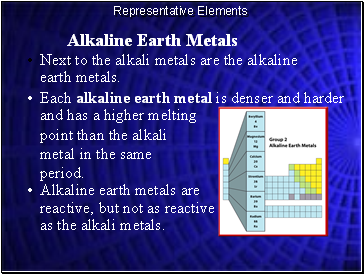 Alkaline earth metals are reactive, but not as reactive as the alkali metals. 2) Reactivity increases as you go _ the group. This is because the electrons are further away from the _ every time a _ is added, so they are given up more easily.